Are you a creative person who helping others feel better and feel better about themselves? Are you bored by the thought of a desk job and thrive on change? If so, a career in cosmetology, esthiology, or massage therapy may be the perfect career for you. 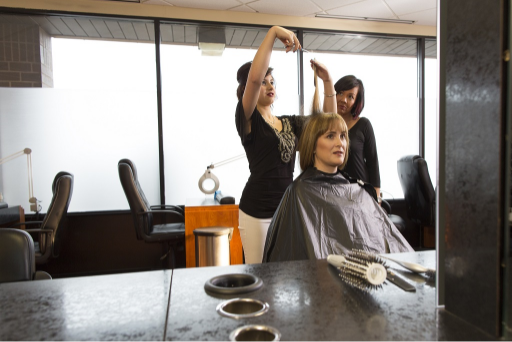 At Minnesota School of Cosmetology, we can help you get the hands-on training you need. We want to help make the admissions process as easy as possible so you can get started pursuing your dreams. Our friendly and helpful admissions representatives will meet with you one-on-one to walk you through each step of the process. We will also schedule a financial aid meeting to determine if you qualify for loans, grants, and scholarships. If you are ready to take the first step. contact admissions or call 1-877-541-8777 to speak with a representative. Feel free to call 1-877-541-8777 with any admissions questions or to schedule a tour of our school. We welcome parent participation in the college application process. Your can also request more information online. If your son or daughter is considering cosmetology school, he or she may be looking to you for support and guidance. We applaud you for helping your child make an informed decision about college. Below are some points to consider.